Scott Shots Photography Blog. Follow the adventures of Truckee / Tahoe, CA photographer Scott Thompson. Photographs, locations, advice, how to's, Q&A, and more. A walk back in time, when everyday life was a bit scarier. 2011 Truckee Historical Haunted Walking Tour. BANG!!! Gunfire right from the start gets you in the mood. "Fussin', Fightin', and Fornicatin'" were normal everyday Truckee experiences in the late 1800s. During the Truckee Haunted Historical Tour, you get to experience that way of life up close and personal. Gunfights, yelling, drinking, town secrets, ghosts, music, and ladies of the night. 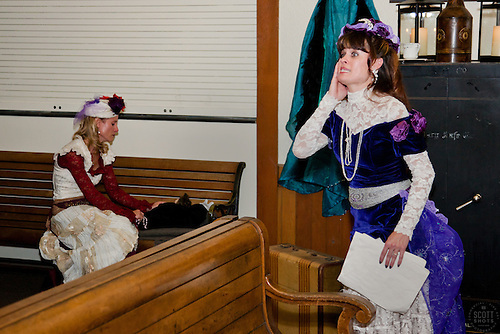 The Truckee Haunted Historical Tour is an annual fundraiser for Tahoe Trails and Vistas and for the Truckee Historical Society. I shot some promotional photos for the event last year, but this year I was lucky to shoot the whole tour. When the tour started, a local lawman dressed in old western clothing told my group that "there is a gang of criminals on the loose" and the lawman's partner showed us an old wanted poster. Our guide then took us on a stroll through Downtown Truckee to the Art Obsessions gallery (a gallery where I sell my photos) where we heard stories, drank libations, and were even offered a lady of the night. The old creepy building and basement downstairs that used to be a saloon were a perfect setting for a haunted feel. Next, a little further down the road, a pianist treated us to some jokes and played a drinking song on a very old beat up piano that has been around Truckee for ages. Visits at different sites throughout the town got us even more stories from historically dressed docents, gunfire, and even more offers from "working" ladies. Jiboom Street, hidden behind the more respectable businesses, had quite the history of being a red light district. Eventually we made our way to the old Truckee jail. Truckee had a lot of people go through it's jail back in the day, even some famous outlaws like Baby-Face Nelson. We got to see one of them break out and escape! And then we saw a local lawman shoot and kill him... The performance was a lot of fun for the senses, a bit of chaos, interesting old clothing, loud bangs from guns, and the smell of gun smoke. No historic tour of Truckee would be complete without a visit to one of the many bars in town. We gathered at the Tourist Club for more ghostly stories and shots of booze. I don't usually drink on the job, but it was almost the end of the tour, so cheers! A little whisky helped me forget my fears of all the haunted tales. One last stop at the Train Depot was unforgettable. A long time friend of mine gave a great performance about the sad tale of a tiny circus sideshow woman who died during a huge snowstorm while in a stuck train near Truckee. She also sang "Amazing Grace." I had no idea she could sing that good! It was the perfect ending for an educational and entertaining evening. More information about the Truckee Haunted Historical Tour can be found at www.TruckeeHistoryTour.com. Next Halloween season, you should treat yourself to a walk back in time, when everyday life was a bit scarier. 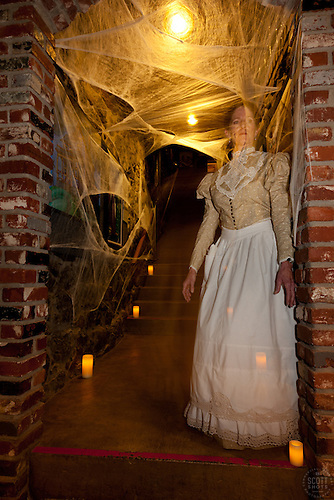 Please enjoy this slideshow of images from the 2011 Truckee Historic Haunted Tour. Prints are available, click on an image, then click "buy photo" for purchasing info. 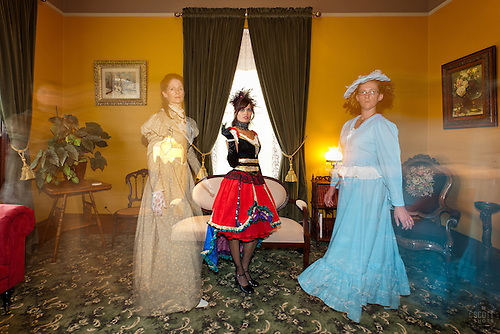 There is more than one way to create a ghost image, but for a similar look to my Historical Haunted Tour ghost photos, I recommend doing the following. You'll need low light for the photo shoot, either indoors or if you're outside, shoot it at dusk or night. Use a DSLR or a camera capable of shooting in manual mode. Use a tripod. You're going to use a long exposure. A shutter release cable is preferable. Use a flash, second-curtain synchronization is preferable but not necessary. You'll probably need to adjust the power a littler lower than a normal proper exposure calls for. Set your shutter speed to 2 seconds as a starting point. Set your aperture to f9 as a starting point. Have any "ghost" models walk during the exposure, the flash can help freeze the ghost but the movement will make it appear see-through. A little bit of light on the model during movement will be necessary for any ghostly streaks of color like in the image below. Any non-ghost models need to remain perfectly still during the whole exposure. Adjust your shutter speed, aperture, and flash power level as needed. It usually takes me at least a few photos to dial in the exposure perfectly. Any questions about this method? Please ask in the comments area below. Also, I'd love to see your ghost photos, please post a link. Happy ghost hunting! "Ghosts at the Richardson House" - Photos of ghosts at the Richardson house during the 2010 Annual Historical Haunted Walking Tour in Downtown Truckee, CA. -My Aerial Photography Adventure (and Photo Tips). Scott Thompson after an aerial photo adventure. Last Saturday morning, I woke up ready to go shoot the "golden hour" from an amphibious airplane. Unfortunately, the fog was so thick, the early morning flight did not happen. But mother nature did it's thing, the fog eventually burnt off, and I got to do something most people will never be able to check off their bucket list: fly in an amphibious seaplane and touch down on Lake Tahoe! The whole experience was incredible. 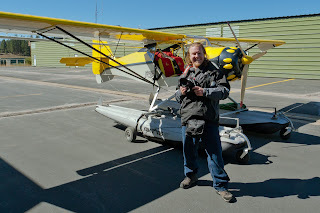 The plane was a tiny two seater with no room for even a camera bag, and it was only 80 horsepower. Taking off with the door removed was a little unnerving, but I immediately was presented with photo opportunities and I quickly forgot all feelings of fear. 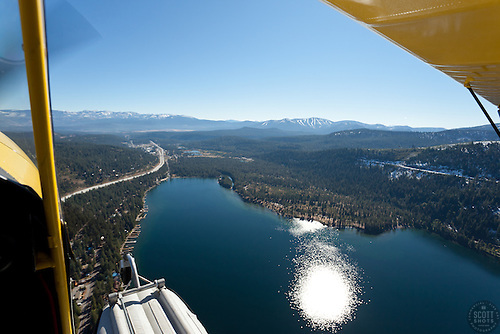 "Downtown Truckee Aerial 1" - Downtown Truckee photographed from a small amphibious seaplane with the door removed. Donner Lake can be seen in the distance. After shooting Downtown Truckee, we made our way slowly to Donner Lake. I had flown with the pilot before in his Cirrus but the "amphib" was a much slower ride. It was a perfect speed for photography. Donner Lake was looking gorgeous with the fresh little bit of snow we had above it. "Seaplane over Donner Lake" - Photograph of Donner Lake in Truckee California. Shot from an amphibious seaplane with the door removed. Next, we made our way to Lake Tahoe! I got some nice photos along the shore and we eventually made it to our goal, Emerald Bay. Again, incredible photos! Then Pierre, the pilot, wanted to check out nearby Fallen Leaf Lake, I wasn't going to argue. This is where things got even more interesting. "Emerald Bay, Lake Tahoe Aerial 5" - Photograph of Emerald Bay in Lake Tahoe, shot from an amphibious seaplane with the door removed. Cascade Lake can be seen on the left. After getting a few great photos, Pierre decided he would show me what it's like to "touch down" on the water. We couldn't stop because at the elevation we were at, we wouldn't have had enough horse power to take off again with both of us in the plane. So we skimmed along the surface on the plane's pontoons for a few hundred feet. I had no idea I would be getting to experience that when I stepped into the seaplane a little while earlier. The speed, the splashing, the noise... it was an incredible rush, one I would probably never experience again. I was wrong. We had a little trouble gaining altitude out of Fallen Leaf, but after corkscrewing our way up out of the little "valley", we were on our way. We headed back to Lake Tahoe, Pierre had so much fun showing a rookie a "touch town", he decided to do it again. This time in Tahoe! I will never forget that moment, not too many people have had that experience. Thank you Pierre! At this point, I knew I had priceless photos but we weren't done yet. 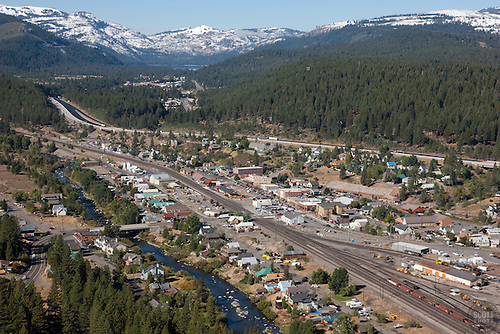 On our way back to the airport, I was able to get aerial photos of Tahoe City, the Truckee River, and more of Truckee, CA. Landing was a bit scary with the big pontoons and the tiny little wheels on them. But Pierre is an awesome pilot and of course everything went smooth. Available as fine art prints, gift items, and as stock photography. Dress warm. Tahoe can be cold in the morning, flying 60-80 mph at altitude with no door was cold. I wore my ski jacket and that worked well but I wish I had some thin gloves with grip on them. My hands got very cold and stiff, to the point that it was a bit hard to operate the cameras. Use your camera strap and think twice about changing your lens. You don't want to end up dropping your lens like this person did. I brought two cameras so I had two lenses ready to go. A huge zoom lens is not necessary when flying at low altitudes. I find my 24-105mm lens works great for just about all the shots I want. A 200mm lens could work but the 400mm range is probably overkill. I also used a 17-40mm lens to get some shots of the pilot and interior of the plane. Lens Shade??? I used mine and would again. But the wind was so strong, the lens shade acted like a little parachute. It was actually hard to zoom the lens out and I did get a little nervous that it might fall off the lens. Shoot fast. Most of the photos that were shot at a shutter speed of 1/800 of a second were tack sharp, a few weren't. All of the photos I shot at 1/1000 or faster were tack sharp. Shoot while on speed priority mode. I tried to shoot on manual mode like I usually do, but the lighting and scenes change so fast, I decided I would get more photos if I switched to speed priority. Polarizer??? I skipped the polarizing filter. The blues were incredibly blue already. A polarizer can often make the blues of Lake Tahoe look fake if it is already a very blue day for the lake. Tissues. I should have brought a tissue of some kind. The cold winds can cause a runny nose, I had to clean the back of my cameras after the shoot. Gross, I know. Hope you enjoyed my story and aerial photography tips. If you have any questions, please ask in the comments area below. Thank you. I recently photographed the 2011 Trails and Vistas Reflections and Rhythms, an incredible art hike in the Tahoe area. The Trails and Vistas hike is filled with different art installations, mostly performance art, and takes place along a mellow hike in a beautiful outdoor setting. This year's event was held at Spooner Lake, near Lake Tahoe. Trails and Vistas is a very popular event up here in Tahoe. People travel here just to attend the event and many people volunteer to help make the event a success. I've been lucky to shoot it the last three years. I find myself fascinated by how popular and loved of an event it is. Why is it so loved? Do people feel a greater connection with performance art than with most types of art? I produce nice fine art photography but I don't think anyone would ever volunteer to help me out with any of my projects. I think it might have to do with being able to look the performer in the eye. The performer can express an artistic idea in a way no 2D or 3D art piece can do. You can look in to the performer's eye and read emotion. You can connect with the performer, feel their feelings. Whether they are telling a story or dancing or playing music, you can connect easier and deeper with a performance artist than you can with someone who creates a piece in a gallery. Here's a slide show of the 2011 Trails and Vistas. It's not as good as actually being there, so be sure to check out www.TrailsAndVistas.org and "like" them on their facebook page so you'll know when tickets go on sale next year. Click on an image above for purchasing information. Available as prints and greeting cards. 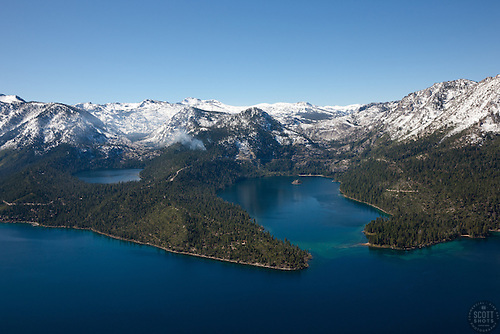 Emerald Bay, Lake Tahoe Gallery added. My Kayak, What a Great Photography Tool.